Agriculture is one of the most vulnerable economic sectors to the impacts of climate change, specifically those related with expected changes in water availability. 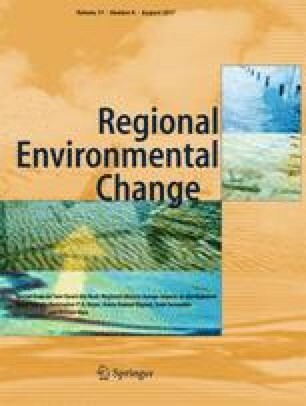 By using a hydro-economic model, this study assesses the distributional impacts of climate change, considering the geographical location of each farmer’s community and the spatial allocation of water resources at basin scale. A hydrological model, the Soil and Water Assessment Tool model, describes the basin hydrology, while farmers’ economic responses are represented using a non-linear agricultural supply model. We simulated a reduction in both water endowment—by perturbing the hydrologic model with a regionalized climate change scenario—and agricultural yields, in order to assess the behavior of farmers’ communities. We also assessed the effectiveness of a water policy aimed at decreasing the vulnerability of farmers’ communities to climate change. At the aggregated level we found relatively small impacts, consistent with the existent literature. However, we found large distributive impacts among both farmer’s communities and agricultural activities. The water policy showed to be effective to reduce those impacts, but our results suggest the existence of unwanted effects on rainfed agriculture, as in some communities the level of income decreases when the policy is implemented. Editor: Juan Ignacio Lopez Moreno. The online version of this article (doi: 10.1007/s10113-017-1152-2) contains supplementary material, which is available to authorized users. This study was funded by the International Development Research Centre (IDRC-Canada) (N° 106924-001), by the Water Research Center for Agriculture and Mining (CRHIAM) supported by CONICYT/Chile in the framework of FONDAP 2013 (N° 15130015), and the Interfaculty Research Project (2016): “Evaluacion de la Amenaza, Vulnerabilidad y Riesgo Hidrometeorologico en la Agroindustria” at Universidad del Desarrollo.